Learn to read while having fun! Zany illustrations, funny animal stories, and teacher-approved learning methods come together in this collection of 10 story booklets for young readers to enjoy. collection of humorous stories and zany illustrations! Each of the stories in this Now I'm Reading! 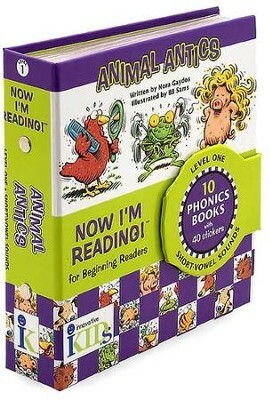 Level 1 reader focuses on one specific short-vowel sound and uses simple, clear text and a building-block approach to help beginning readers have fun while learning key words. Includes 10 story booklets, 40 incentive stickers, "After You Read" easy comprehension questions and "Skills in This Story" sections in each book, and a parent guide to help parents get the most out of each story booklet. Perfect for ages 4 and up! Level 1 NIR readers focus on short vowel sounds, simple consonant sounds, and beginning sight word introduction. The concepts and skill progression in the NIR series are aligned to meet Common Core State Standards. This book is Fountas & Pinnell Level B/C. I'm the author/artist and I want to review Animal Antics, Level 1.